You're late! Lunch is nearly over and the sammiches are running out! It's time to put some sammiches in your belly and fast - before King Torg and the other kobolds eat 'em all (or worse yet, eat you). You may just have to make your own lunch with some Knuckle Sammiches! Play cards from your paw to your plate to eat sammiches, eat the other kobolds, avoid being eaten by King Torg, and other silly things. When all the sammiches are gone, lunch us over, and the kobold with the fullest belly wins... which could be the King! 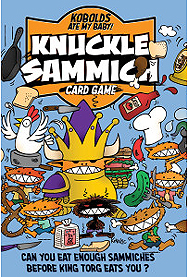 Knucle Sammich is a fast playing game of take-that shenanigans, occasional shouting, and delicious sammiches for 2 to 8 players.